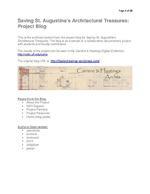 Page 4 of 20 NEH Support The Saving St. Augustines Architectural Treasures project is supported by a Save Americas Treasures grant, administered by the National Park Service and the National Endowment for the Humanities (NEH). Page 8 of 20 Society of Florida Archivists Annual Meeting 2011 Posted on June 15, 2011 by kimtinnell At the beginning of May 2011, Leslee Keys, John Nemmers, Laurie Taylor, and myself presented on various aspects of this project at the Society of Florida Archivists Annual Meeting which, fittingly, was held at Flagle r College. The response to the project was very positive and I think many others who are embarking on similar projects or have architectural drawings/blueprints in their colle ctions were able to get ideas on how to move forward on preserving those objects. The presentations are available to view th rough the University of Floridas Digital Library and are linked below. Saving St. Augustines Architectural Treasures: About the Project John Nemmers, UF Descriptive Archivist Saving St. Augustines Architectural Treasure s: Conservation of Architectural Drawings Kim Tinnell, Conservation Technician/Student Assistant Saving St. Augustines Architectural Treasure s: Digitization of Architectural Drawings Laure Taylor, UF Digital Library Center Posted in Uncategorized | Leave a comment Conservation Treatment-Hotel Ponce de Leon Large Drawing Continued Posted on January 24, 2011 by kimtinnell We are continuing work on the very fragile, large drawings of the Hotel Ponce de Leon. As noted in the previous post on these draw ings, we have already separated them into three separate sections (as they originally had been), removed the dirty cloth backing, cleaned the surface of the paper, reattached loose pieces, and backed them with a heat set tissue to keep the loose pieces intact and provide the paper with some support while they were being digitized. We have decide d to remove the heat set tissue backing and back these drawings with Japanese paper.